The Mixed (Coloured) Cloth Hall, George Walker, 1814. At first, Leeds had just a White Cloth Hall but as other West Riding towns started to vie with it for the trade, it built a bigger and better White Cloth Hall and then a Mixed Cloth Hall, too. m, Vol. I, Birth and Growth (New York: Barnes & Noble, 1970), pp.37-38]. Yesterday I was in Leeds for the day so thought I’d go on about this important ‘wool’ city and its history. For some of the day, I was in the Local History Library, researching a Napoleonic mill owner’s diary. For the rest of the day, we visited the Art Gallery, Museum, and Royal Armouries and got some great pics. Like everyone who grew up in my village in the 1960s, I was born at St James’ Hospital, in Leeds. So technically, am a ‘Loiner’ like my father, grandfather and great grandfather. Even if I only “lived” there til I was ten days old! My family, the Listers, were alternately wool weavers/clothiers and croppers right down to my great grandad who broke with tradition and became a printer. Recently mentioned this to a curator of a West Riding Museum, when we were documenting some Great Wheels in his reserve collection, and he commented “They were the elite of the West Riding wool trade” (the croppers). 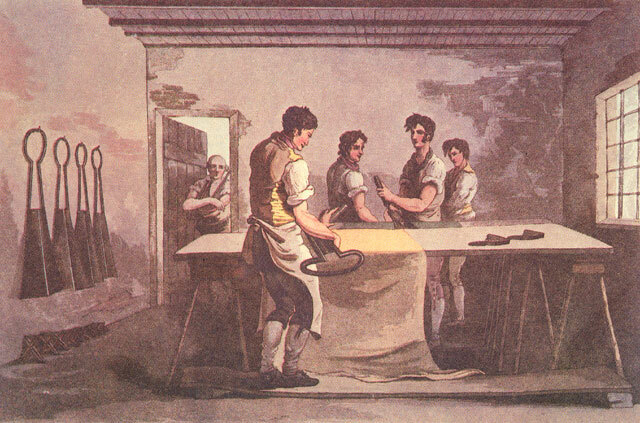 The croppers were so skilled at finishing the woven cloth, their work added a great deal of value to the cloth’s price. My great great grandad, Tom Lister, came to Leeds from Huddersfield. He was a cropper, his father a weaver from Halifax who came to Huddersfield around 1816, just a handful of years after the Luddite croppers had been active in Huddersfield and Halifax. So far as I can trace, this lot go back and back in Halifax, as wool weavers/croppers. This had been the biggest brick wall in our family history, and we only finally broke through it in December, 2012, so I am still coming to terms with the fact my wool love is in the blood! Somewhere round about 1971, we had a student teacher come to teach us for part of a term. She came in one day having looked up the meanings of all our names. When she got to me, I was intrigued to hear my first name meant “weaver of cloth” and my surname, by coincidence, “dyer of cloth”. Lister is a name thought to originate in medieval Leeds, so it seems my West Riding weavers went full circle, returning to Leeds in the mid 19thC. I can do the Leeds equivalent of “I remember when it was all fields round here” – as the glassed over shopping area in the Victoria Quarter, next to County Arcade, I can remember when that was still a road and can remember being driven down it! I have always loved Leeds’ arcades, and long been fascinated by this particular gilt mosaic on the dome of the County Arcade. All of this along the usual grand civic lines of Industry, Labour, Prosperity, etc. Leeds must have the most stunning late Victorian and Edwardian civic architecture, in the country. Endless classical and progressive themes explored on various buildings, around Briggate and beyond. And this is just one of many references to the wool industry; romanticised and slightly illogical as it is. The spinner appears to have some kind of distaff but no discernible spindle. By the time this mosaic was made, hand spindles had fallen out of folk memory, in England and the spinning jenny had enjoyed a good hundred years or so pre-eminence. My own Halifax hand-weavers came to Leeds to work in vast, mechanised mills. That was the way of it. Nothing to do with spinning whatsoever, but Thornton’s Arcade holds many happy memories, for me. As a child, I would go into Leeds on the bus with my mum and many is the time she’d race across town from the bus station, to get to Thornton’s Arcade as the clock struck the hour. Apparently, it is called ‘The Ivanhoe Clock’ but we always knew it as ‘the Robin Hood Clock’. The clock was made by William Potts and Sons of Leeds and shows Robin Hood, Ivanhoe, Frair Tuck (in the skimpiest monk’s habit ever) and someone called, remarkably, Gurth the Swineherd all characters from Sir Walter Scott’s ‘Ivanhoe’. Leeds seems to have had a love affair with Sir Walter, as his head is one of the literary greats depicted in bas relief in the magnificent Tiled Hall, at the Art Gallery. Another place that holds great memories is Leeds City Market. 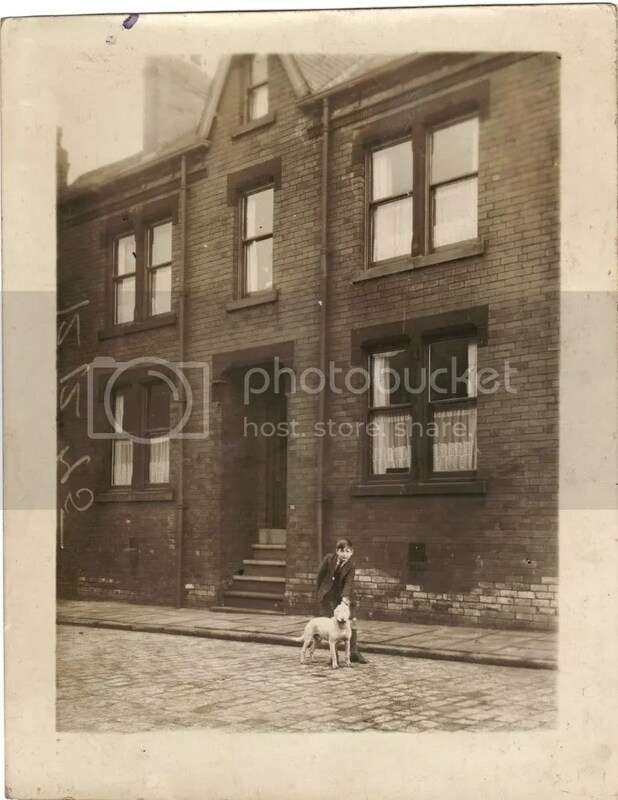 My grandfather – the one whose grandfather was the cropper – walked into the city centre most days and went to the market. I never go in there but I think of him. Leeds’ symbol is the owl, of course, and also sheep pop up on various coats of arms and insignia around the city, given the city’s proud woollen industry history. But the third most common bit of Leeds iconography is the dragon. The market’s wrought iron dragons are the first thing I think about, when I think about Leeds. My grandfather was incredibly active and fit for a man in his seventies; and was on his boat on the Ouse near York when he wasn’t walking rapidly through the streets of central Leeds. The time we spent on the river with him, is part of the reason I got interested in the inland ganseys. Next, we were on to the Royal Armouries, by the Aire and Calder canal’s wharf – another relic of Leeds’ once mighty industry. The canal j oins with the Leeds & Liverpool around this point, as well. Those of you awaiting ‘River Ganseys’ should know we have documented a number of gansey motifs from the canals. These boats carried all kinds of freight and were the arterial routes that held the life-blood of the West Riding’s commerce. Now of course, only a handful remain, mainly as pleasure boats of one kind or another. Of course, canal boats weren’t the only form of transport for the wool packs. On our travels yesterday, we wandered through Leeds’ new shopping centre, Trinity. Although our wool trade – once the greatest in the world – is long gone, its place in our hearts will never be erased, and ‘Equus Altus’ is keeping our heritage alive in one way, as today’s textile craftsfolk do, in another. Knitting For Victory Talk – There Will Be Cakes (Possibly). From Jane Waller and Susan Crawford’s “A Stitch In Time, Vol.1”. Just a heads-up for this weekend’s riproaring events. I am doing a talk on Saturday, about wartime knitting. It’s going to be an interesting day as straight after my 1940s’ talk in my Victory rolls and 1938 “Such Flattering Puffed Sleeves” jumper (see pic left – if only I looked as good as these girls!) I will morph into being a Tudor person at Bolton Castle for the rest of the weekend, with the Great Wheel. At the Farming Museum, I will be talking about two aspects of 1940s’ knitting: war effort “Knitting for Victory” and also what happened to traditional Fair Isle patterns, in the 1940s, as people saw their potential for using up oddments. If you fancy the idea of this talk, book on the number below or just turn up. You will be most welcome! (And bring your knitting). More about Murton Park’s Women’s Land Army project, here. On the day, any donations to the Women’s Land Army Tribute memorial, will be very gratefully received. I have donated my time gratis for this talk, to maximise the money we can raise. I have no idea what “1940s’ themed refreshments” are. Hopefully not Spam and gravy browning… I’m hoping for cakes. Alternatively, if you fancy a trip to the Dales this weekend, I am the Tudor lady in the dubious stays, and red linen petticoat, spinning on a Great Wheel, at Bolton Castle. You’d be most welcome there, too. You can find the inestimable Susan Crawford on her website, here. You can support the Land Army Tribute Campaign, by buying Susan’s lovely “Wartime Farm Sleeveless Pullover” pattern or kit. The jumper in the first pic, Susan Crawford’s “Such Flattering Puff Sleeves” can be found here, on Ravelry. ‘A Stitch In Time’ is now available as a download, as well as in hard copy. Links there, on Susan’s Rav page.